One cup of frozen Petit Peas. A pinch of freshly grated nutmeg. One spring of fresh thyme or 1/3 teaspoon of dried thyme. One box of dried penne pasta (I prefer whole wheat pasta because it is healthier but regular pasta is good as well). You could also use any other shaped pasta. Cut the medium onion into slices. Cut the roasted bell pepper into slivers (I prefer the jar sold at Trader Joe’s because it is extremely good quality and quite inexpensive but any other jar of roasted bell pepper works well as well. Or you could also roast a fresh red bell pepper over an open flame to char the outer skin and then wrap the charred pepper in tin foil and place in a 350F oven for 10-15 minutes. Then unwrap the tin foil and wash the pepper under a stream of cold water and scrape the skin off and remove the seeds from the inside. Cut the flesh of the pepper into thin slices). In a large skillet start cooking the bacon so that the fat is rendered out and the bacon is crispy and brown. In another separate large pot heat up water for boiling the pasta (make sure there is plenty of water for the pasta to swim and cook in!) and when the water is boiling add a little bit of salt to the water and the pasta. When the bacon is crispy, take the bits out and place over a dry kitchen towel to take the fat out. Drain the bacon fat out of the skillet and then add Extra Virgin Olive oil to the hot skillet. To the skillet add the sliced red onion and the garlic pieces and keep stirring to prevent any burning of the vegetables. When the onions are a little cooked, add the red bell pepper and frozen petit peas (if you are using fresh peas, please use the very tender small shelled peas). Cook the vegetable for 5-6 minutes. Add the salt, pepper, oregano and thyme to this mix of cooking veggies. Drain the penne pasta when it looks cooked al dente. 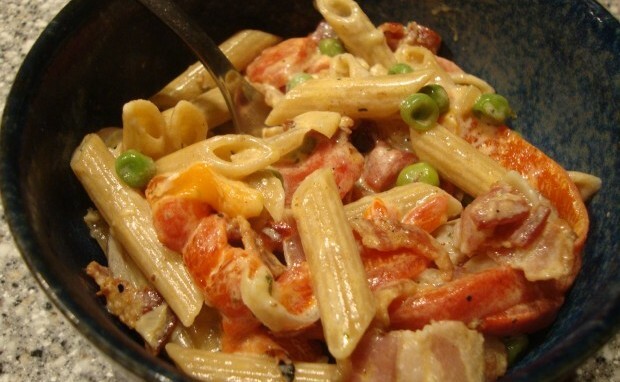 Add the cooked pasta and the cooked bacon to the veggie mix and stir thoroughly. Add the light cream to the skillet and continue to stir for a minute or two. Add the grated nutmeg to the pasta at the very end and stir well. Serve the pasta with a generous sprinkling of freshly grated/slivered parmesan cheese.